Juicy Couture presents Viva La Juicy, an enticing scent of wild berries and mandarins, honeysuckle, gardenia, and jasmine. To round it out, amber, caramel, vanilla, sandalwood, and praline add just the right touch of sweetness. I just purchased this 100 ml perfume spray almost a month ago in ebay. I got it from AVR, a reputable seller of perfumes. The perfume comes in a pretty fuchsia box which I can't just throw away because it's cuteness. Anyhow, the bottle is quite heavy compared to my other 100 ml perfumes. The cap comes with a pretty fuchsia bow and a "J" charm attached to it by a safety pin. The bottle also comes with a gold plated Juicy Couture logo. 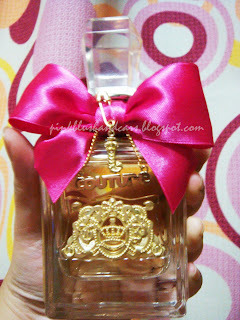 The bottle itself is really pretty, very girly and sweet. So far I'm inlove with this scent. I almost use it everyday even if I'm just stuck in the house the whole day. The smell is kinda fruity, sweet like candy and floral-ish. What I really noticed too is the top note of vanilla which reminds me of my Mom's perfume too. The scent is very refreshing, just perfect for the tropical weather we have here in the Philippines. I also got a lot of compliments using this! One thing I just noticed is the scent doesn't stay very long that much. I usually spritz more or less 6-8 sprays all over my body yet after 3-4 hours the scent fades already. I asked my mom and sister if they can still smell the scent on me and they said it's not that noticeable anymore. But what I really love about this perfume is that it's not too overpowering. The scent is so refreshing. I don't know if I'll purchase another bottle after I consume this since I get tired of same scents after using them for awhile. LOL. I tend to keep empty bottles of my drained perfumes too as they are just too adorable to be thrown away.